The colonial period of Indonesia did not immediately start when the Dutch first arrived in the archipelago at the end of the 16th century. Instead, it was a slow process of political expansion that took centuries to reach the territorial boundaries of present-day Indonesia. During the course of the 18th century the Dutch United East India Company (Vereenigde Oost-Indische Compagnie, abbreviated VOC) had established itself as the dominating economic and political power on Java after the crumbling and collapse of the Mataram empire. This Dutch trading company had been a major power in Asian trade since the early 1600s, but started to develop an interest to interfere in indigenous politics on the island of Java in the 18th century as that would improve their hold on the local economy. However, mismanagement, corruption and fierce competition from the English East India Company resulted in the slow demise of the VOC towards the end of the 18th century. In 1796 the VOC went bankrupt and was nationalized by the Dutch state. As a consequence its possessions in the archipelago passed into the hands of the Dutch crown in 1800. However, when the French occupied Holland between 1806 and 1815 these possessions were transferred to the British. After Napoleon's defeat at Waterloo it was decided that most parts of the archipelago would return to the Dutch. Two names stand out as being architects of the new Dutch colonial state in Indonesia. Firstly, Herman Willem Daendels, Governor-General from 1808 to 1811 during the French occupation of Holland and, secondly, British Lieutenant Sir Stamford Raffles, Governor-General from 1811 to 1816 during the British occupation of Java. Daendels reorganized the central and regional colonial administration by dividing Java into districts (also known as residencies), each one headed by an European civil servant - called the resident - who was directly subordinate - and had to report - to the Governor-General in Batavia. These residents were responsible for a wide range of matters in their residency, varying from legal matters to the organization of agriculture. Raffles continued the reorganizations of his predecessor (Daendels) by reforming the judicial, police and administrative system of Java. He introduced the land-tax which meant that Javanese peasants had to pay tax, approximately the value of two-fifths of their annual harvests, to the authorities. Raffles also had a sincere interest in the cultures and languages of Java. In 1817 he published his The History of Java, one of the first academic works on the topic of Java. However, his administrative reorganizations meant an increasing intervention in Java's society and economy by foreigners, which is reflected by the growing number of middle ranked European officials working in the residencies. Between 1825 and 1890 this number increased from 73 to 190. The Dutch system of rule in colonial Java was both direct and dualistic. Alongside the Dutch hierarchy, there existed an indigenous one which functioned as an intermediary between the Javanese peasants and the European civil service. The top of this indigenous structure consisted of the Javanese aristocracy, previously the officials that ran the Mataram administration. Now, however, they had to execute the will of the Dutch center. The increasing Dutch dominance over Java did not come without resistance. When the Dutch colonial authorities decided to build a road on the land of prince Diponegoro (who was appointed as guardian of the throne of Yogyakarta after the sudden death of his half-brother), he rebelled, supported by a majority of the Javanese population in Central Java and turned it into a jihad war. This war lasted from 1825 to 1830 and resulted in the deaths of approximately 215,000 people, mostly on Javanese side. However, when the Java War was over - and prince Diponegoro captured - the Dutch were more dominant on Java than ever before. Competing British traders, the Napoleonic wars in Europe and the Java War implied a big financial burden on the Dutch kingdom's budget. It was decided that Java should become a major source of revenue for the Dutch and therefore Governor-General Van den Bosch ushered in the era of the Cultivation System in 1830. This system meant a Dutch monopoly on the cultivation of export crops on Java. Moreover, it were the Dutch who decided what kind of crops (and in what quantity) had to be delivered by the Javanese peasants. Generally it meant that Javanese peasants had to hand over one-fifth of their harvests to the Dutch. In return the peasants received an arbitrarily fixed compensation in cash which basically had no relation to the value of the crop on the world market. The Dutch and Javanese officials received a bonus when their residency delivered more crops than on previous occasions, therefore stimulating top-down intervention and oppression. On top of this compulsory cultivation of crops and traditional corvee-labor services, Raffles' land tax still applied as well. The Cultivation System turned out to be a financial success. Between 1832 and 1852 around 19 percent of total Dutch state income was generated from the Javanese colony. Between 1860 and 1866 this figure reached around 33 percent. Initially, the Cultivation System was not dominated by the Dutch authorities only. Javanese power holders and private European as well as Chinese entrepreneurs joined in as well. However, after 1850 - when the Cultivation System was reorganized - the Dutch colonial state became the dominant player. But these reorganizations also opened doors for private parties to start exploiting Java. A process of privatization commenced in which the colonial state gradually transferred export production to Western entrepreneurs. More and more voices were heard in the Netherlands that rejected the Cultivation System and supported a more liberal approach for foreign enterprises. This rejection of the Cultivation System was both for humane and for economic motives. Around 1870 Dutch liberals had won their battle in Dutch parliament and successfully eliminated some of the characteristic features of the Cultivation System, such as the cultivation percentages and the compulsory use of land and labour for export crops. These liberals paved the way for the introduction of a new period in Indonesian history, known as the Liberal Period (circa 1870 to 1900). This period is marked by a huge influence of private capitalism on colonial policy in the Dutch Indies. The colonial state now more or less played the role of supervisor in relations between Western enterprises and the rural Javanese population. But - although liberals claimed that the benefits of economic growth would trickle down to the local level - Javanese farmers suffering from hunger, famine and epidemics were just as common as under the Cultivation System. The 19th century is also known as the century in which the Dutch made substantial geographical expansion in the archipelago. Driven by the New Imperialism-mentality, European nations were competing for colonies outside the European continent for both economic motives and status. One important motive for the Dutch to expand its territory in the archipelago - apart from financial benefit - was to prevent other European countries from taking parts of this region. The most famous and prolonged battle during this period of Dutch expansion was the Aceh War that started in 1873 and lasted until 1913, resulting in the deaths of more than 100,000 people. The Dutch would, however, never have full control over Aceh. But the political integration of Java and the Outer Islands into a single colonial polity had largely been achieved by the start of the 20th century. When the borderlines of the Dutch Indies began to take the shape of present-day Indonesia, Dutch Queen Wilhelmina made an announcement in her annual speech in 1901 informing that a new policy, the Ethical Policy, would be launched. The Ethical Policy (acknowledging that the Dutch had a debt of honour towards the Indonesians) was aimed at raising the living standards of the native population. The means to accomplish this was direct state intervention in (economic) life, promoted under the slogan ‘irrigation, education and emigration’. This new approach would, however, not prove to be a significant success in raising the living standards of Indonesians. This Dutch Ethical Policy implied one profound and far-reaching side effect. Its educational component contributed significantly to the awakening of Pan-Indonesian nationalism by providing Indonesians the intellectual tools to organize and articulate their objections to colonial rule. The Ethical Policy provided a small Indonesian elite with Western political ideas of freedom and democracy. For the first time the native people of the Archipelago began to develop a national consciousness as 'Indonesians'. In 1908 students in Batavia founded the association Budi Utomo, the first native political society. This event is often regarded as the birth of Indonesian nationalism. It established a political tradition in which cooperation between the young Indonesian elite and the Dutch colonial authorities was expected to lead to acquiring some degree of independence. The next chapter in the development of Indonesian nationalism was the founding of the first mass-based political party, the Sarekat Islam (Islamic Union) in 1911. Initially, it was formed to support the indigenous entrepreneurs against the dominating Chinese in the local economy but it expanded its scope and developed a popular political consciousness with subversive tendencies. Other important movements that led to the unfolding of indigenous political thinking in the Dutch-Indies were the Muhammadiyah, an Islamic reformist socio-religious movement founded in 1912 and the Indonesian Association of Social Democrats, a communist movement founded in 1914 that spread Marxist ideas through the Dutch Indies. Internal disunity in the latter would later lead to the formation of the Indonesian Communist Party (PKI) in 1920. Initially, the Dutch colonial authorities permitted the establishment of indigenous political movements but when Indonesian ideologies radicalized in the 1920s (as seen in the communist uprisings in West Java and West Sumatra in 1926 and 1927) the Dutch authorities changed course. A relative tolerant regime was replaced by a repressive one in which every suspected act of subversive behaviour was suppressed. This repressive regime in fact only worsened the situation by radicalizing the entire Indonesian nationalist movement. Part of these nationalists established the Indonesian Nationalist Party (Partai Nasional Indonesia, abbreviated PNI) in 1927 as a reaction to the repressive regime. Its goal was full independence for Indonesia. Another important occasion for Indonesian nationalism was the declaration of the Youth Pledge in 1928. At this congress of youth organizations three ideals were proclaimed, to wit one motherland, one nation and one language. The main aim of this congress was to stimulate the feeling of unity between the young Indonesians. On this congress the future national anthem (Indonesia Raya) was played and the future national flag (merah-putih) was shown for the first time. The colonial authorities reacted with another act of suppression. 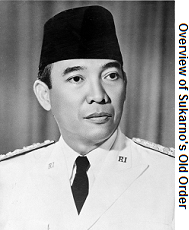 Young national leaders, such as Soekarno (who would become Indonesia's first president in 1945) and Mohammad Hatta (Indonesia's first vice president) were arrested and exiled. The Dutch were powerful enough to curb Indonesian nationalism by arresting its leaders and suppressing the nationalist organizations but never were they able to eliminate nationalist sentiment. The Indonesians, on the other hand, did not have the power to compete with the colonial rulers and therefore needed outside help to eliminate the colonial system. In March 1942 the Japanese, fueled by their desire for oil, provided such help by occupying the Dutch Indies. Although initially welcomed as liberators by the Indonesian population, Indonesians would soon experience the hardship of the Japanese rule: scarcity of food, clothing and medicines as well as forced labour under harsh conditions. The scarcity of food was mainly caused by administrative incompetence, turning Java into an island of hunger. Indonesians working as forced labourers (called romusha) were stationed to work on labour-intensive construction projects on Java. It should be emphasized, however, that within each of these three groups - Indonesians, the Dutch, and academics (in this case mainly historians), - there exists plenty of variety. But we can discern three broad versions. What separates the Indonesian and Dutch versions from the academic version is clear: the Indonesian and Dutch versions are colored by specific sentiments and/or political interests, while the academic version aims to deliver an objective and accurate version, not based on sentiments but on evidence (sources). The reader may now wonder which version he/she read just now? Well, the overview of Indonesia's colonial period that is presented above is a synopsis of the academic version. However, it is interesting to provide some information about the Indonesian and Dutch versions. With these versions we mean the general consensus and views that are shared by the people (this includes the ordinary people but also government officials, and those who wrote the history books for the younger generations, etc.) in each nation. Obviously, the Indonesian and Dutch versions have a lot in common. However, due to both sides' involvement in this colonial history there exist some differences that can be attributed to sentiments and political interests. For example, when you talk to an Indonesian individual about the colonial period (whether the individual is highly educated or uneducated) he/she will say that Indonesia was colonized by the Dutch for three and a half centuries. What is wrong with this statement? First of all, it supposes that Indonesia already was a unified nation in the late 1500s or early 1600s. However, in reality the country we now know as Indonesia was a patchwork of independent indigenous kingdoms that lacked a feeling of brotherhood or nationalist sentiment or any other sense of unity. In fact, wars between these kingdoms - either inter or intra island - were the rule rather than the exception. Secondly, the whole area we now know as Indonesia was not conquered by the Dutch around the same time and then possessed for 3.5 centuries. On the contrary, it took centuries of gradual political expansion before the region was under Dutch control (and in several parts Dutch control was very superficial, such as Aceh). In fact, only around the 1930s the Dutch more-or-less possessed the whole area that we now know as Indonesia. Some parts indeed were colonized for 3.5 centuries (for example Batavia/Jakarta and parts of the Moluccas), other parts were dominated by the Dutch for some two centuries (such as most of Java) but most other parts of this huge archipelago were gradually conquered over the course of the 19th and early 20th century, and in many regions natives never saw a Dutch person. So, why does there exist the view that (the whole of) Indonesia was colonized by the Dutch for three and half centuries? The answer is politics. As becomes clear from the synopsis above, Indonesian nationalism was driven by the realization among the young and diverse people of the archipelago (whatever their ethnic, cultural or religious background was) that they had one common enemy: the Dutch colonial power. Having this enemy is basically what unified the native people of Indonesia. This also explains why - after the enemy was completely gone in 1949 - there emerged a prolonged and chaotic period in Indonesian politics and society between 1949 and 1967. With the enemy gone, all the underlying differences between the people of Indonesia came to the surface resulting in rebellions, calls for separatism, and impossible decision-making on the political level. Only when a new authoritarian regime, Suharto's New Order, took control, chaos disappeared (and, again, at the expense of human rights). After Independence from the Dutch, the Indonesian government needed to keep the Indonesian nation unified. One smart strategy was by creating this common 3.5 century colonial history that was shared by all people in the Indonesian nation. If the Indonesian people would realize that they did not have the same history it would jeopardize the unity of Indonesia, especially in the fragile 1940s and 1950s. In recent years, there start to become more and more Indonesians who are aware of this issue and argue that without the colonial period there would - most likely - not have developed a single Indonesian nation but more likely there would have been various separate nation states in line with the distribution of the old native kingdoms and empires in the Archipelago. The Dutch also have plenty of reason to portray a colonial history that is different from reality. The Netherlands of the last couple of decades is a country that emphasizes the importance of human rights and this does not exactly match its 'rich' colonial history. Therefore, the violent nature of its colonial history is often not mentioned. Instead, the VOC period forms a source of national pride to the Dutch knowing that - despite being this tiny European country - it became the world's richest country in the 17th century (Dutch Golden Age), not only in terms of trade and military but also in terms of art and science. Another interesting case is the apology that was made by Dutch ambassador to Indonesia Tjeerd de Zwaan in 2013. He apologized for the "excesses committed by Dutch forces" between 1945 and 1949, the first ever general apology. However, the Dutch government has never apologized for all violent events that occurred before 1945. In conclusion, it seems that both Indonesian and Dutch perceptions are slowly moving toward the academic version because high emotions (whether resentment or pride) gradually wane as time goes by, while Indonesia's domestic political situation is stable and therefore there is less need to create one common history throughout the archipelago.